1,613 people read this post. At first, you might be saying, well, what’s this to do with fasting? But let’s do some examination. In essence, God is saying that the prayer is hard and difficult, except on people who possess certain qualities. The difficulty in the prayer lies in the fact that we have to perform it five times a day, every single day of our lives. Therefore, it requires a lot of persistence. Likewise, fasting is hard and difficult. But its difficulty lies in the fact that we deprive ourselves from essential pleasures which we take for granted and we incur a certain amount of pain on our bodies, the pain of hunger and thirst. Therefore, it requires a lot of endurance. But whether it’s the challenge of persistence or endurance, Allah forewarns us that it will be difficult if we only focus on the physical aspect of worship. Indeed, when you tell non-Muslims how Muslims fast from dawn to sunset (now an average of 16 hours for many people on Earth), their heads will shake in disbelief. “Whoever fasts Ramadan out of faith while expecting its reward, then all his previous sins will be forgiven” [Bukhari and Muslim]. In other words, you treat fasting as a true and complete act of worship. We don’t do it out of habit, or because my family or my environment expects me to, but because I worship Allah through this act. If we break it down further, worship is made out of our pure love and utter submission. If we were to apply that to fasting, it means I fast out of pure love for Allah and out of utter submission to His command. So when you’re about to fast this time, remember the various bounties that Allah has bestowed you with. Remember the variety of food you have and the availability of cold water. Remember the roof over your head and the decent job you’ve got. Remember all the special bounties that are unique to your and your surroundings. Then say, I’m fasting out of gratitude to this Lord who has given me all this. Every time you feel the pain of fasting, remind yourself that you’re doing it out of love for the Creator who’s the reason for everything you enjoy in this life. In other times, remember that fasting is an ultimate show of utter submission to a command that may not seem very comfortable to follow. You may choose to alternate between the feeling of love and the feeling of submission. “The five daily prayers, Friday to Friday, and Ramadan to Ramadan, will forgive the sins in-between as long as major sins are avoided” [Sahih Muslim]. So it’s clear that we have daily, weekly, and yearly opportunities for forgiveness. So, you may call Ramadan the “yearly cleansing“. This is why in a different Hadith, the Prophet described the one who was able to attend Ramadan yet failed to get his/her sins forgiven as someone who is far [from the Mercy of Allah]. In other words, the only way you don’t get your sins forgiven is if you totally forfeit this opportunity. However, the question remains. Is there some type of sins that only Ramadan can help forgive? If we were to imagine that sins are like shackles that hold us down, then Ramadan is the tool to set us free. I believe this is part of the reason the Sahaba used to have such eager anticipation. Now, since Satan is largely immobilized, we are mostly talking about the sins that stem from the self. Everyone has certain weaknesses that keep haunting them and inviting them to sin. This is different from the method of Satan who is more sporadic and doesn’t really care what sin you commit, as long as you commit it. But here, Ramadan offers more than just breaking away from sins. It offers to break away from addictions and bad habits. When you say addictions, some people think of only drugs and alcohol. But in reality, an addiction is much more than that. In fact, an addiction doesn’t have to be related to something that is Haram. For example, overeating is an addiction. This is why obesity is a big problem in this country. Now, Ramadan offers a great opportunity to break this bad habit. 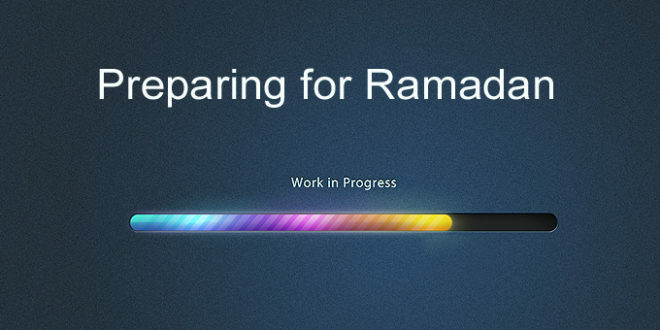 But, you have to be ready and you have to use the tool of Ramadan properly. Otherwise, we all know too well that some people end up gaining weight in the Month of Ramadan. This is not to mention that food gets wasted in Ramadan more than any other month. So, we clearly can see that Ramadan is only a tool and it’s up to us what we make of it. Ramadan will not do miracles if we’re not ready or if we don’t use it properly. Another addiction is oversleeping. Yes, some people might sleep some 10 straight hours missing Fajr altogether and barely making it to work on time. Again, Ramadan offers a golden opportunity to become the master of your sleep. For the busy person in Ramadan, you know you can barely manage few hours of sleep in the row. Yet, some people sleep through the whole day, missing Dhuhr and asr, and not waking up till Iftar time at sunset. Again, we see how Ramadan can be a tool that works for you or against you. It’s all up to you. Another form of addiction is watching TV. For the serious worshiper, even one minute of TV is a waste of time. Even if he/she used to watch TV outside of Ramadan, their time in Ramadan turns to reciting Qur’an, praying voluntary prayers, and making extra du’a and Dhikr to mention a few. Yet, how many new TV shows we see introduced in Ramadan especially in Muslim countries? And no, there not religious shows! They are romantic soap operas, silly comedy and game shows. Once more, we see how one can pretty much defeat the very purpose of Ramadan. Instead of utilizing Ramadan to help you rid yourself of a bad habit, now you’ve turned it up side down and made it a vehicle of sinning or at least watching other people sin. Along of making the intention to fast the whole month, please make the intention that this Ramadan will be like no other Ramadan. You say I will fast this Ramadan out of faith. I will do it for the love of Allah and out of full submission to His order. I will set myself some goals. I want to rid myself of sins that may have plagued me for years. I want to change some of my bad habits and break away from some old addictions. I want to change my life this Ramadan. I intend to make this Ramadan the best Ramadan ever.